I hold the firm belief that the greatest gift we have is, invariably, the power to feel. I believe that our emotions are the purest and most human form of magic. I believe that they transcend the boundaries we have set for them. I believe that they give us the power to do terrible and terrifying things. I believe that they are endless and joyous and disruptive. I believe that they are the most beautiful natural disasters. There is no story greater or older or more inevitable than the one borne of our capability to be heart-liftingly happy and then soul-wrenchingly sad, all in the space of moments. Their names are Icarus and Daedalus. And they are, perhaps, not the first two that come to mind when I speak of the power to feel, however abstract or vague that might be- but if I believe in anything, I believe in a boy with a heart that defines and then defies itself. In his father who plants the seeds. And in both of them, this boy and this man, who are so hapless and courageous that they rewrite their own story. 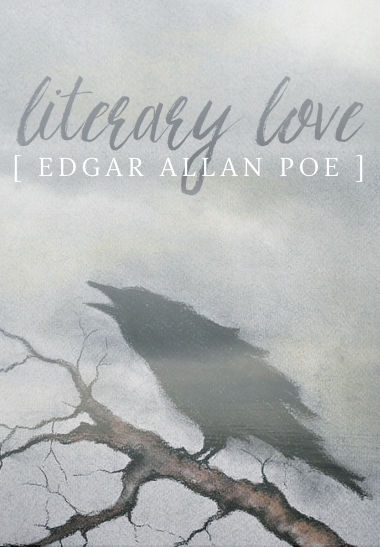 Literary Love, affectionately known as #litlove, is a feature wherein I and friends around the blogosphere extol the virtues of various bookish topics. This month we’re talking about Greek mythology! Don’t forget to check out the others’ posts on this topic: Alyssa on Persephone. We don't often speak of Daedalus when we recount the story of Icarus. He seems to be cast aside too often, left as a footnote in his son's shadow. But Daedalus is just as much part of the story as Icarus: the long, painstaking hours spent moulding the waxen wings; the hiding of his creations from the men who guard him; the gnarled and clumsy fingers of a brilliant architect, fumbling through the building of these enormous wings. These keys to the universe. These manifestations of defiance, of a spark that refuses to die. And Icarus, too-small boy with a too-big heart, who grows up locked away from the wild and beautiful world, who loves his father fiercely, desperately, with all the love he cannot give to the rest of it. Who stares at these wings of feather and wax and sees not just freedom, but a chance to experience all that he has never known. A chance to feel - finally, helplessly, powerlessly. So here they stand at last, poised on this windowsill as the world awaits. And Daedalus whispers into his son's ear: don't fly too high or the sun will melt your wings; don't fly too low or the sea will drag you down. And Icarus says: of course, of course, of course, but here is this feeling again, this fierce and terrible feeling for a world he is so very close to tasting, this feeling he can't yet name - and Icarus says of course, of course, of course, but I think you and I both know he is only listening with one ill-fated ear. So when they take off into the air, it is Icarus who soars high and then low, who pinwheels through the salt-stained wind, who races the oblivious gulls, who laughs loud and giddy and drunk on this newfound freedom, this newfound ability to feel. And when Daedalus calls - be careful, son, be mindful - Icarus does not listen. - and he flies too high. And then Icarus is falling, his wings little more than tattered feathers, and Daedalus is crying from above as his son spirals down - down - down. As he disappears beneath the cruel waves, still glowing. This is the story of Icarus and Daedalus. It is one of tragedy, yes. But. It is also one of fierce and desperate hope. It is one of love. And of anger, and of sadness, and joy, and of dizzying wonder, however fleeting, however short. It is a story of the power of feeling. It is a story not of despair, but of two people who grasped hands and made the choice to fly. And of one who let go and made the choice to fall. It is the story of a man who chose surviving over wilting, and of his son who chose living over surviving. I think that is something all of us can learn from. The power of feeling. The way we grasp hold of the sunbeams - never too low, but always high, high, higher. Somewhere in the distance, a boy with wings is wheeling towards the sun. On his face is the brightest expression, and on his back there are feathers sighing towards the sea. At last - at last - at last - he has learned what it means to feel. For what comes after. For this. For now. Just for now. (FIRST. Are you our sort of a person? Which is to say: are you flawed (but not too flawed)? Perfect (but not too perfect)? Compliant (but not too compliant)? Defiant (but not too defiant)? Intelligent (but not too intelligent)? Airheaded (but not too airheaded)? Which is to say: are you willing to dance exactly the right steps, unless we require you to make a mistake? Literary Love, affectionately known as #litlove, is a feature wherein I and friends around the blogosphere extol the virtues of various bookish topics. This month we’re talking about Sylvia Plath! Don’t forget to check out the others’ posts on this topic: Alyssa on Ariel and Christina on Lady Lazarus & Witch Burning. The Applicantis, hands down, my favourite of Plath's poetry. Which is saying something, because I love all of her work fiercely. But there is something aching and familiar about The Applicant, its scenes of an unnamed young woman tossed from interview to interview, from courtship to courtship, desperately trying to find a deeper sort of love in a world that wants nothing more than to objectify her as nothing more than a living doll. (In your opinion, what are your best qualities? ... Oh dear, please don't brag. We don't need an exhaustive list.) Perhaps Plath was tired of it too, this constant, ever-present fixation on shaping women into aesthetically pleasing robots. Perhaps I am. Perhaps all of us are. Of course, you don't need me to tell you that we live in a world of striking misogyny. You know it, you've seen it, this dark, cloying stain, spreading across to the way we work and the way we love. (Tell us about your experience at your previous company. You do have work experience, don't you?) The standards to which men hold women, to which women hold themselves -- they are contradictory, paradoxical, impossibly and frustratingly high. And Plath understands. Oh, how she understands. The Applicant is a picture of a woman who grooms herself to become what she believes is needed by men, who makes sacrifices she does not fully understand for a prize so coveted -- and ultimately, so disappointing. (What is your greatest weakness? ... No, no, please answer honestly. This is very important for us to know.) It is a raw, striking portrait of the misogyny in marriage, one that is less an indifferent observation and more a cry for help. And this is what makes Plath not only a truly beautiful artist, but also a truly beautiful human being. Maybe we don't need to rearrange our souls in order to find the right man, she seems to say. Maybe we are more than fragile artefacts to be kept behind glass, more than zoo animals in dresses and false eyelashes. Maybe we don't need to reach impossibly high or sink impossibly low, to squeeze ourselves too small or stretch ourselves too large. Maybe who we are is good enough for now. The Applicant is a poem of uncertainty and of oppression -- but I believe it is also more than that. In the final stanza, Plath delivers a soothing reminder: we do not exist to conform to the standards of what society demands, of what men demand. We are all that we need. Just as we are. Just as we have always been.